The Standard Bank National Youth Jazz Festival, which runs concurrently with the Standard Bank Jazz Festival and is part of the National Arts Festival in Grahamstown, has become one of the most important jazz development initiatives in the country. Now in its 25th year, it brings together over 300 students and 40 teachers, from diverse backgrounds from all over South Africa, with nearly 90 professional jazz musicians and educators. The festival lasts for six days, and incorporates innovative jazz performances, rehearsals, workshops, lectures, networking and the opportunity for South Africa’s future jazz stars to interact personally and musically with their peers and the country’s top performers. At the end of the festival the students audition for places in the Standard Bank National School’s Big Band and the National Youth Jazz Band. These bands, under the musical direction of a leading jazz educator and performer, then perform a concert on the main jazz festival stage. The success of the programme can be measured by the fact all but three of the musicians in the Festival Big Band are ex-members of these two youth ensembles. I had the pleasure of attending the performance of the Schools Big Band in the DSG Hall and can gladly report that the future of jazz music in this country is in excellent hands. The boys and girls of this band, under the musical direction of the experienced trombonist and big band leader Kelly Bell, showed maturity, poise and skill way beyond their years. All the performances were astonishingly good with tenor saxophonists, Mosses Seblo from Thembisa High and Michael Hoyle from SACS in Cape Town being the particular stand-outs. The rhythm section was as solid as a rock and overall the sound was tight, cohesive, perfectly pitched and very musical. Eight members of the band came from Rondebosch High School in Cape Town and five from Stirling High in Port Elizabeth. Several of the youngsters have been in the band for two and three years. 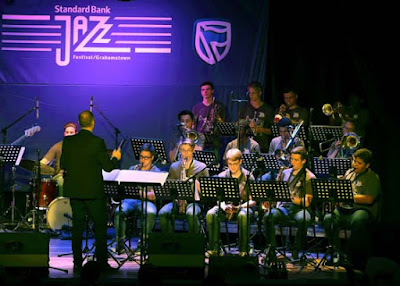 The high standard of Schools Big Band is testament to the success of the Standard Bank National Youth Jazz Festival. It is a wonderful initiative and hugely beneficial to those who attend. Not only from a music point of view but also for the opportunity for them to interact, and to learn about each other’s cultures. To hopefully spur on some of our local schools here is some contact information.